Preparation for a telephone interview is as important as preparation before any other form of interview or meeting. The impression you create in the opening moments, and the manner with which you present yourself will determine whether or not you will be successful. Find out as much as you can about the company and the job description. If your telephone interview has been arranged by a third party, you should receive much of this information from them. But in any case, do your own researches - company websites are one of the best sources of information. Find out about the size and structure of the company, its products and its markets. Make a note of any questions you would like to ask. Ask about things if they are important to you, especially if your decision whether to proceed depends upon the answers (for example: will I have to relocate? (if that is something you don't want to do!). Otherwise, ask broad questions such as 'What training will be given? ', 'What opportunities are the for advancement?'. Have these questions written down. Have a notepad and pen ready, along with your diary. Have your CV at hand. In all probability the hiring manager will have a copy of it too, so you probably won't be asked to describe your background in detail. Prepare mentally, or better still in writing, a very brief 'potted history' to answer the demand 'Tell me about yourself.' Managers ask this not because they want the information (they already have your CV! ), but because they want to listen to you, to find out how communicative you are, and how you sound. Example: I left college and decided to get into sales within the scientific field, but I needed a job straight away, so I took a stop-gap job as a clerk in the local tax office. I hadn't intended to stay so long, but there weren't many opportunities in my area for the sort of job I was looking for. After about six months however, I got a chance to join X-Company as a telephone sales person, selling scientific supplies, and I'm still there now. I wouldn't be looking for a new job except that there are no opportunities in my company to progress into field sales. This is why I'm particularly interested in joining your company Mr Brown. Tone of voice. This is the most important aspect of this form of interview. The detail is of very little importance - the manager has your CV, so they know exactly what you've done, and in all probability wouldn't be talking to you if they weren't essentially interested. Think about how you normally answer the phone at home. When you answer the phone, do so by announcing your name, in an enthusiastic style: 'John Pickles, Good Morning!' If this is not your natural style, change it! Ask open-ended questions (beginning with who, what, when, why, where, how: these all ask for information, and keep the ball in the other person's court). Be prepared that they will do exactly the same! Be polite: speak to Ms (not Miss or Mrs. - even if you know their marital status), or Mr. Jones. If you are invited to use their first name, then use it. Use their title if you know they are for example, a doctor. What are your strengths? (Again, be careful. If you know for sure what the manager is looking for, you can tell him ('I'm strong in ion-chromatography') but if you don't know this, you're better off saying you have general, positive characteristics ('I've been told I have energy, enthusiasm and 100% commitment to the job I'm working on'). Don't over-egg it though - the manager may want you to substantiate your claims! If the manager says something negative, try to overcome the objection. If it's crucial that Mr Brown has to hire a ready-made expert, you probably aren't going to get the job. But you could try to keep the door open by saying 'Well, if you don't find what you're looking for Mr Brown, please call me as I'd be really keen to join your company'. Having tried your best to overcome the objections, always ask a question, in order to throw the ball back in the other person's court. Part of the purpose of the telephone interview (from the hiring manager's perspective) is to find out how keen you are, and (especially in the case of sales jobs) whether you have natural closing ability. This approach is particularly important if you are applying to sales jobs, as you are expected to demonstrate your natural salesmanship. But even in the case of other jobs, most people will appreciate your keenness and enthusiasm. If they don't, and you lose the job on account of being 'too pushy' (most unlikely) well, is it the sort of job you wanted anyway? What should you take to the interview? What will the procedure be? Will they be able to make a decision after the next interview? If not, what will happen after that? How many people are you up against? What is the most important thing the company is looking for? Don't worry if you don't feel able to ask all these questions. The first three questions are the most important obviously. If your telephone interview has been arranged by an agent/recruitment consultant, telephone them immediately to let them know the outcome. They should be able to find out the answers to the other questions, on your behalf. Remember, the most important things that all employers are looking for, in any circumstance is energy, enthusiasm and 100% commitment to the job. Good Compilation Sara I would like to add one more point. If it is a position with a major company or University/Hospitals, the first interview would be a HR interview and it is mainly a screening interview to check your enthusiasm and communication skills. So by the end of the interview, if you get to here, Nice talking to you, come up with the question, what is the procedure from now on in the selection process. That would get you the answer for how long you could wait for an answer and will you be called for another round Technical Phone-Interview. Don't be afraid to pick up the phone! The telephone interview is by far becoming more and more popular. Many job hunters still get that adrenalin rush even with the phone interviews. But following the tips and advice in this article will help you master the phone interview and get you to the next step - the face to face interview. Often, the first step in the hiring process is the telephone interview. Companies and the recruiters they employ use the telephone interview to develop a pool of candidates to look at closer, and to pare down the number of applicants for a job opening. the list of questions can be standardized. the interview can be delegated to a lower level (cheaper) employee. it can be done quickly. The aims on both sides of the telephone are limited. 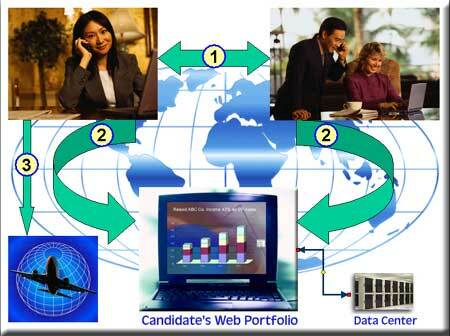 The caller wants a selection of qualified candidates, and the process screens out many candidates. If the call is a straightforward screening call, the caller will likely ask about your experience, availability and salary requirements. Your strategy is to provide facts that support your resume, with some context about your performance. Try using numbers and facts to be effective, however, you don't want to volunteer anything that could disqualify you . Make every effort to sound professional but not personal, as this call is not to establish rapport. Since you are unlikely to win the job from a telephone interview, your goal is to secure an in-person interview with the person who has the authority to hire. Approach the call with that attitude. Try to reschedule surprise interviews. Say that you have a conflict and suggest a time you can call back. When you call back, be prepared for the call just as you would for a full-dress interview. the job ad and the resume and cover letter which you sent in response to the ad. a list of your accomplishments which relate to the job you are discussing. research you have done on the company. a short list of questions about the job. Smile - it comes through in your voice. Speak directly into the phone. Don't smoke, chew gum, eat or drink anything. It all telegraphs to your listener. Stand up. Your voice sounds stronger. Avoid ah, er, hum. This habit is especially noticeable on the telephone. This takes practice. So practice. Confirm the caller's name and company. Get the caller's telephone number. Be aware that the caller can't see you - can't see your hand gestures, can't see you taking notes. Pace the call. Let the caller do most of the talking, without interruptions. Do use the technique of repeating or re-phrasing questions. It tells the caller that you listened carefully, and gives you time to think about your answer. Avoid the simple yes or no; add selling points at every opportunity. If you need time to think, say so - as in radio, silence during a telephone conversation is dead air time. Compensation issues come at the end of the interviewing cycle, never at the telephone stage. You can truthfully say you don't know enough about the job to state a salary figure. And, of course, you would need a personal interview to really talk with the company. Which is another way to go for the personal interview. Re-affirm your qualifications, express your interest in the job and the company. Say you would appreciate the opportunity to talk about the job further - in person.